I need help! – Nice dress! Thanks, I made it!! I am finding I have serious questions that Mr. G.T. (Green Thumb) just doesn’t care to answer … so I have decided to turn to you. What do you say? I have this fabric – actually lots of this fabric. Specifically, an “Addison Jersey Knit Chevron” in Hunter green and in Red. 85% polyester and 15% rayon. There is a bit of a gold thread running through them so sometimes they look a bit shiny. Three meters each – I told you I had a lots. What can I say, it was a good price! It is a big print. If you look at this photo, the chevron stripe is about 2″ from tip to tip and about 3″ tall. My fabrics are light and summery, but the print might be too much? I had nothing in mind when I bought it. (What can I say, it was a really good price!) I bought it, packed it away and never thought of it again. Then when I was cleaning up/putting away my supplies and fabric stash the other day (I actually threw out some small remnants that were too small to be useful. ), I realized that I knew what every piece in my fabric stash was destined to be “some day”, except for these two “black sheep”. 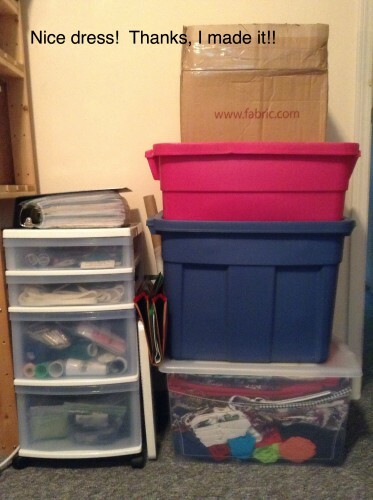 Supplies and fabric put away. I photographed every meter of fabric, with a note about what it was and where it was, before I closed the lids. Can you believe it? I have found this photo, a possibility, and pinned it to my Pinterest board so that I don’t forget. are either of these fabrics destined for summer culottes? if so, should I use the darker Hunter green or the red? if not, what should I make out of these fabrics? I JUST NEED SOME IDEAS! I can’t imagine having these two fabrics packed away in a box without a destiny! Any thoughts? Leave me a comment, tell me where to find a photo, a pattern, have you made something with a chevron print I should peak at? I am away in Vancouver helping my sister with fabric choices for a MOG (Mother of the Groom) dress, but I will check back here periodically to see what you have come up with! Please help! I thought maxi dress when I saw that fabric. The cullotes may work though. Good luck! Ah yes, there’s an idea! Thanks! I thought wrap dress but I also like the maxi dress idea. Remember, if the stripes are going horizontally they will make you look shorter and wider, so a maxi dress which is a long column with counteract that for you. Sorry, I can’t switch off the technical part of my brain!! Hey, that’s great! Any ideas help! Even technical ones! Whatever you decide to make, make sure the zig zags match at the seam. That’ll make your meterage disappear but it will look far more professional and expensive. It’s lovely fabric. Thank you! I saw a lady wearing a RTW blue and white chevron skirt. I assume it was RTW because they hadn’t bothered to match the stripes on both sides, just one! Yet the topstitching was impeccable! Or a classic wrap. Hot Patterns do a lovely kimono wrap – http://www.hotpatterns.com/products/HP-1008-Wong%252dSingh%252dJones-Kimono-Wrap-Dress.html . I didn’t immediately think of culottes but hey, why not? While we’re at it – a jumpsuit? I made a plain A-line skirt with a matchng tank https://corecouture.wordpress.com/2013/05/18/may-2/ (scroll through to see). Whatever your pattern I think it should be very plain and let the fabric do the work. Thanks, for the links. I agree the fabric is busy. I should keep it simple! I think these would make a great maxi – as was suggested above! theres a load of dresses in this link: http://www.next.co.uk/search?w=maxi&isort=score#1_798 I love next for inspiration. i think cullottes could work – but maybe full length? or a swooshy maxi skirt? Thanks! I hadn’t heard of “Next” yet. It’s funny how we sewist get our inspiration not only from other sewing and fashion bloggers, but also from store windows, the designers themselves, and on-line sites like “Next”. I always like seeing it, not buying it, and trying to re-create it myself, being a RTW faster! But I an glad to see that others are actually using Chevron prints in the garments. I do like the dress in the second link. I will also support the maxi dress idea, or maxi skirt, I made the Syrah Skirt recently and thought it might work with the chevron http://selvagedesigns.com/product/syrah/ but the culottes seem cool too. I prefer the hunter green. Good luck and I look forward to seeing what you’ll make with it. Hmm, the fabric would look pretty cool full length, wouldn’t it? I agree, the green is nice – it is a very “calm” print. The red is definitely lively! Yes I think you would need to make something to show off the fabric, so full length seems appropriate, but you could make a top/tunic style or maybe a kimono jacket with the red which is more lively and it may look too much on a maxi dress. Personally I would have no problem wearing either of them, they are both great colours. Oh! I never thought of a kimono style jacket! I have seen some pretty lively prints in those too! These fabrics are not stiff, so they will hang nicely! 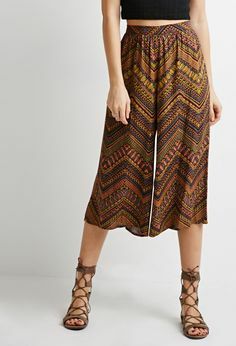 I Like culottes in the more muted one but I like maxi dress or something simple and asymmetrical or perhaps with av curved hem and points at the sides and then plain pants to go with it , for the bright print . Now I had forgotten about hem variations – curved or pointy? I’ll have to go have a look at those again. Thanks! Oh yes, being 5’5″ I do understand where you are leaning! The good news is if I make culottes, they are easy to turn into a skirt when culottes are no longer in fashion. The bad news is I am risking looking “stumpy” in culottes! 😃 Thanks for the input! Yes, I think a long swooshy dress would be stunning in this fabric. The Missoni brand is famous for its use of chevron prints, I’d check out the styles and their placement of the stripes. Good luck! Yes, they have nice dresses, etc too. I looked at their store/on line site. Every time I see the price and/or quality of RTW (I am a RTW faster), it brings me such joy! To spend $1000 or $2000 on a skimpy dress is ridiculous, (rampant excessive consumerism, don’t you think?) especially when anyone with a sewing machine and some fabric and some patience can do it themselves, better fitting, better quality, less money. I love making my own “knock offs”! Thanks for giving me some ideas! I think the culottes would work. My first thought was a maxi skirt, rather than a dress. The pattern might be too much for a dress. But you can easily find out and just wrap it around you and see how it looks as dress or culottes/skirt. Haha, I never thought of trying on the fabric. These were bought on line, so I didn’t even think about how they look on me or what could I do with them. But trying on the fabric, full length, half, or even less would give me a good idea of how much of it I want to wear! Thanks! The suggestions given all sound great for this fabric. I wouldn’t consider 5’5″ as short, just average. That’s from the perspective of being only 5′.5″ myself. I’d love to have that extra 4.5″! I have to admit that sometimes a fabric I bought and later could not feature wearing, became a decor item, like table covers or pillows, bed throws or travel or closet clothing covers. Some can be worn in smaller amounts such as scarves, tote bags, sashes, collars & cuffs. Maybe it would make attractive linings for some other item. I can also see it as a full sleeved button front shirt to wear with pants or slim skirts. Oh, if I was 4.5″ taller I could be a fashion model at my present weight! (Maybe!) Cool! Scarves, sashes, accent pieces all sound like good ideas! I have seen a couple of tops on Pinterest today that I like too! Thank you for your ideas! Hi Linda, I’m also a shorty (5’4″ on a good day) – I think there are a lot of us! 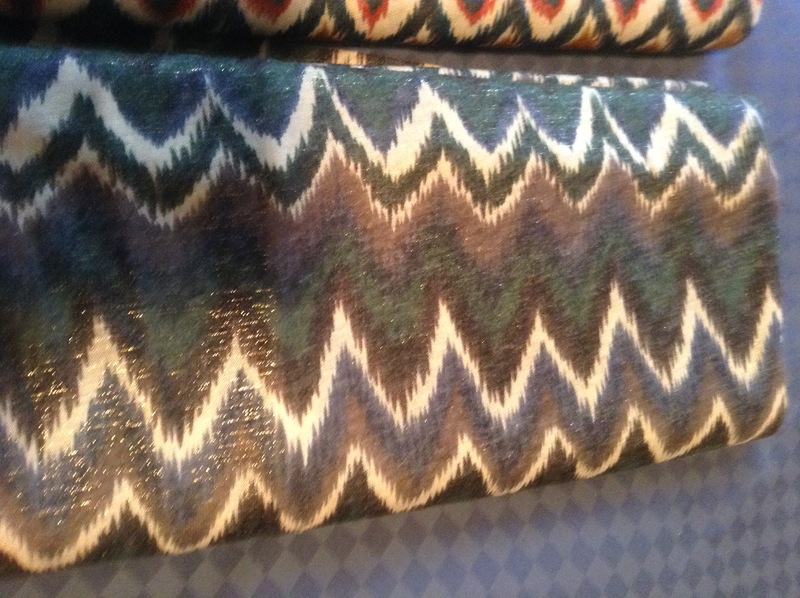 I thought immediately of Missoni (lots of chevrons) and a maxi dress or skirt seems perfect. Also along a completely different line, how about a large tote or duffel? There are some beautiful skirts out there with the lovely chevron lines on them! A lined tote might work. I have pinned a duffle bag or small backpack, but this fabric is quite soft. I just love all the ideas I have seen! My initial thought was drape! Drape those fabrics, one at a time, all over yourself in front of a mirror, and take selfies. Download pics onto your computer so you can really see & study the fabric & how it looks in various drapings. How does it feel (try to remember!)? Did it sag a bit too much for something full length? (Or just need seam reinforcement to prevent sag?) Try the fabric in every direction possible! Every once in a while I’ll have this same problem. When I drape it & photo meself, then really look at the pics, I can see which ones work & which don’t. Hope this helps! Yes, it does help! When you see clothes in the store you can try them on. I don’t often think of trying fabric on at home or taking selfies of myself. But we should! Just hope it helps with your decision-making! I like the culottes, but we all know they’ll be out of style by the fall so go with the maxi dress. On a completely different point, when I read MOG I thought “mother of god” not “mother of the groom”, yeeeesh! Make me laugh! The groom is a nice boy. I’m sure he doesn’t think of himself like that! I keep collecting photos of Chevron prints on Pinterest. Everyone has been so helpful! The first thing I thought of was a maxi skirt, mainly because I have a maxi skirt in a chevron pattern and have worn it a ton since last summer. Second thought, given the colours, is loose fitting fall jacket, a poncho, or even a long vest like Bea Arthur wore when she played Maude. The colours are really great for late summer or fall. They are pretty fabrics, aren’t they? I shall go google chevron print jackets now, out of curiousity! Thank you for the ideas. Gosh you have got yourself a load of advice already. I particularly like Ruth’s Core Couture suggestions. 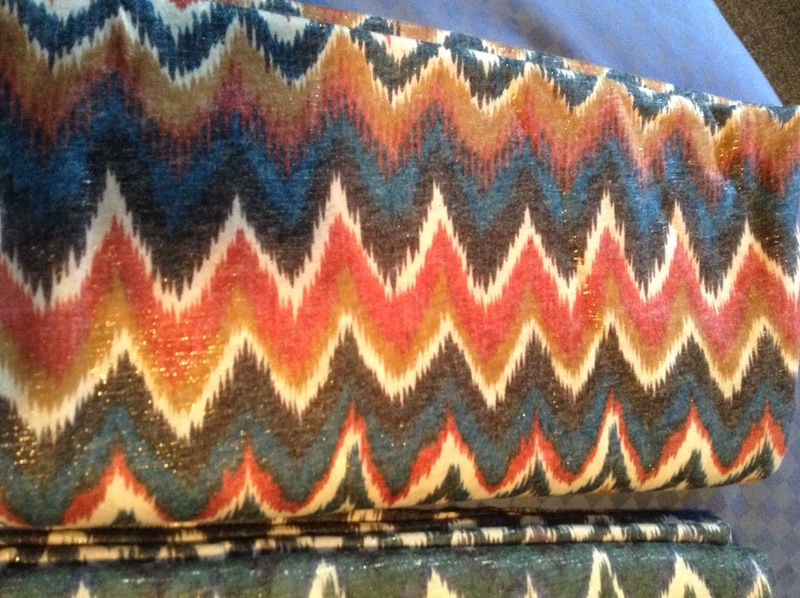 And having a look at what Missoni makes from this fabric, as Nice Day in LA suggests, is a great idea. Thanks for the vote and stopping by! I’m all for draping it on your body and taking photos. Such thick chevrons make a strong statement and unless they suit your personality and movements, they will overwhelm you. You know you have entered that realm when people compliment your garment instead of how it looks on you. You can do all the work and make a great outfit but if it is shouting and not letting you shine through, it is not your fabric. Do the colors even work with your skin tone, is a metallic gold thread going to enhance your companion pieces? Will it hang, no matter what it ends up, hanging in the closet as an orphan? These are just things to test before you put more effort into cutting and sewing. I agree, funny you say that because presently I am working on a couple of garments I made a while ago – redoing them – because “as is” I cannot bring myself to wear them, so I am going to try one more time with them! More on this in a post to come yet. Thanks for your supportive comments!